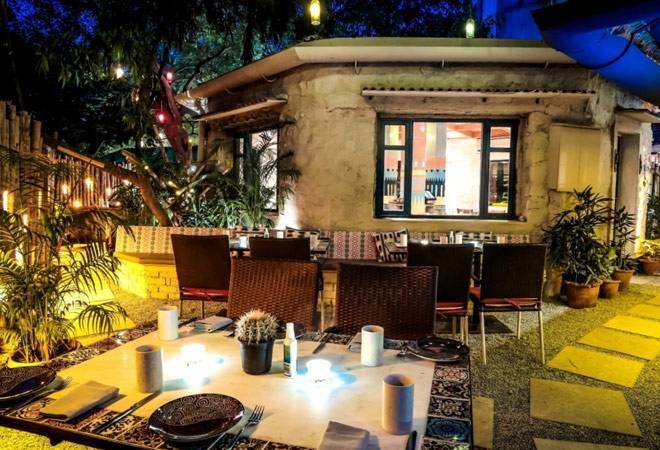 Go down the corridor that begins at Tabula Beach and you find yourself along a bamboo enclosure that opens up into Arriba, Delhi's newest Mexican grill and tequileria. For years, the restaurants houses in the Asiad Village have been screaming out for a new lease of life, but it is only in recent times that the zone has got a facelift that is well deserved. I walked in on a week night and the din and buzz of groups of people having a good night could be heard well before the restaurants were visible. Go down the corridor that begins at Tabula Beach and you find yourself along a bamboo enclosure that opens up into Arriba, Delhi's newest Mexican grill and tequileria (yes it is a tequila bar so get into your shots zone). The open space as you enter houses a couple of tables and a bar, which is usually a good location to park yourself for the evening if your love your spirit. Enter the octagonal spaced restaurant and you are greeted with popsicle orange and lemon sorbet coloured pillars with a decidedly Mexican pattern on them. The same colour scheme is reflected in the chairs and other furnishings. The space has a terrific vibe and is the kind of restaurant you don't mind spending an entire evening in, over drinks and dinner. The lighting was a tad dim for me but it adds to the ambience of the place. The menu favours non-vegetarians but some staples, like the fresh guacamole which is prepared at your table (and has three types of accompanying salsa) served with tacos would make anyone happy. Love your meat? You absolutely have to try the pork skewers. Don't be fooled by the enormous peppers that form a generous part of this platter as they are not spicy. The pork itself is high on spice so be ready for some real heat to be lavished on your mouth as you devour it. The tuna tenderloin is definitely more Asian than Mexican but the flavours manage to convince you that it occupies a fitting place on this restaurant's menu. The street sweet corn skewers slathered generously with melted cheese were delicious and the panuchos also come highly recommended. Wash your meal down with some of the wicked cocktails on offer; the frozen coconut margarita is a real winner and the tequila crafted shots are inventive as well. End your meal with the churros served with two types of chocolate. The churros were a trifle dry and hard but tasted great with a dollop of chilli chocolate. Aribba is perfect for a celebration or an evening out with the girls and has an easy, rhythmic vibe with music to match. A must try even if Mexican food isn't really your thing.